The goal of the school is to introduce Particle Physics and Astroparticle Physics to 3rd and 4th year physics students while at the same time touching on the latest results and challenges in these fields. For about a week, students will be immersed in an international research atmosphere, and will be able to spend time and discuss at length with scientists working in the field. 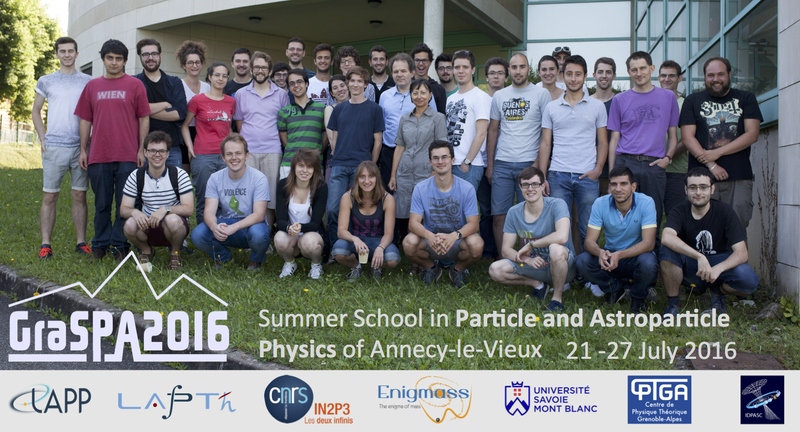 There will be lectures on both the theoretical and the experimental sides of LHC Physics, Neutrinos, Flavour Physics and Astroparticle Physics (dark matter and cosmic rays), as well as a Computation Tools hands-on session and Questions sessions. This year, our lecturers will tell you all about the exciting hints unveiled by the LHC last December, and there'll be a special lecture course on the discovery of Gravitational Waves announced in February.